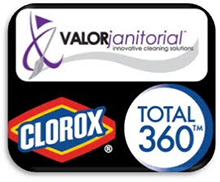 "We have used several cleaning services for the last three years. Valor has been the only one that delivered the service that was promised. Having Jerri to rely on, she has been able to resolve any issues or concerns I may have had with our office. I have a day porter which is very professional in her job as well as appearance. The crew at night is doing an excellent job with the time constrains we require. TAG also has a townhouse that Valor has taken on with great results. I am looking forward to our partnership lasting for years to come." This testimonial was written for our nightly cleaning service at The Apparel Group building.